1 to 2 level teaspoons daily, mixed with water or juice. Research proves that the positive effect of taking L-proline on joints and skin may be noticed in the case of taking 500 and 1000 mg a day, therefore it is worth starting the treatment first from half a recommended dose and then gradually increase to 2000 mg. 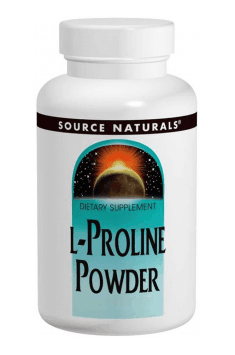 In order to facilitate the transformations of L-proline in the organism and its positive effect, it may be combined with vitamin C.